Sponsored by: Columbia Global Centers, SIPA MENA Forum, Middle East Institute, and ArteEast. The New York Forum of Amazigh Film will celebrate the 5th Annual Amazigh Film Festival exploring North African Identitites. Sponsored by LaGuardia Performing Arts Center, LaGuardia Community College, International Oriental Film Festival of Geneva, and Columbia University Middle East Institute. Paper Boat (2017) directed by Mahmoud Abu Ghalwa. A shelter in Gaza during a bombing. A young couple waits in the small claustrophobic room. She is pregnant, but how can she give life to a human being in these conditions? The future father is lost in the memories of his childhood. A reflection on freedom, slavery and surrender, sustained by a pressing emotional tension. Director in attendance. Degrade (2015) directed by Ahmad Abu Nasser and Mohammed Abu Nasser. The Gaza Strip today. Christine’s beauty salon is crowded with female clients: a bitter divorcée, a religious woman, a woman addicted to prescription drugs and a young bride-to-be, among others. However, their leisure is disrupted when gunfire breaks out across the street. A gangland family has stolen the lion from Gaza’s zoo, and Hamas has decided it is time to settle old scores. Imprisoned in the salon, the women begin to unravel. Scenes from the Occupation in Gaza (1973) directed by Mustafa Abu Ali. A work created from a French news report about the Gaza Strip that Abu Ali re-edited, adding additional footage and a new commentary. This is the only film produced by the Palestinian Cinema Group, a large collective of Palestinian and Arab filmmakers and artists who came together in 1973 for the purposes of creating a vibrant Palestinian revolutionary cinema. Voices from Gaza (1989) directed by Antonia Caccia and Maysoon Pachachi. Voices from Gaza is the first full-length documentary produced after the start of the first Palestinian intifada. With minimal commentary, it allows the people of Gaza - 70% of whom are refugees - to tell their seldom-heard story. In the film Palestinian men, women, and children speak frankly about the effect of Israel’s occupation on their lives, but also about their organized and empowering grassroots resistance to the occupation. Gaza Diary (2001) directed by Taysir Batniji. Combining still and moving images, Batniji’s short experimental film invites reflection on daily life and violence. Al-Wafaa (2014) directed by Yassir Murtaja. Al-Wafaa is the sole hospital in the Gaza Strip that serves the needs of the disabled. This is the story recounted by its staff and patients of their experience being shelled and bombed during the 2014 Israeli attack. Shuja’iyah: Land of the Brave (2014) Directed by Hadeel Assali. Shuja’iyah: Land of the Brave represents one filmmaker’s personal reflection on the meaning of “crimes against humanity” in the context of Israel’s ‘Operation Protective Edge’ waged in the Gaza Strip in 2014. Juxtaposing footage of her family filmed in the summer of 2013 against audio from the summer of 2014 Assali poses the question, when we say ‘crimes against humanity’, what ‘humanity’ are we talking about?” Director in attendance. Daggit Gaza (2009) directed by Hadeel Assali and Iman Saqr. Politics, food, and family are the topics of a phone conversation between Houston and Gaza that serves as voiceover commentary to the preparation of a spicy tomato salad. Ouroboros (2017) directed by Basma Alsharif. Ouroboros is acclaimed visual artist Basma Alsharif’s first feature film. This experimental film is an homage to the Gaza Strip and to the possibility of hope based on the eternal return. The film follows a man through five different landscapes, upending mass-mediated representation of trauma. The film is a journey outside of time, marking the end as the beginning and exploring the subject of the eternal return and how we move forward when all is lost. Abdel Salam Shehada will talk about dreams and reality, images and imagination. He will share stories from his life, his beginnings in film as a cameraman and a visual album of his journey. Samouni Road (2018) directed by Stefano Savona. In the rural outskirts of Gaza City a small community of farmers, the Samouni extended family, is about to celebrate a wedding. This will be the first celebration since the latest war. Amal, Fuad, their brothers and cousins have lost their parents, their houses and their olive trees. The neighborhood where they live is being rebuilt. As they replant trees and plow fields, they face their most difficult task: piecing together their own memories. Through these young survivors’ recollections, Samouni Road conveys a deep, multifaceted portrait of a family before, during, and after the tragic event that changed its life forever. Winner of the L’Œil d’or prize for best documentary at the 2018 Cannes Film Festival. My 3 Dreams (2018) directed by Mohamed Nayef Ahmed Ali, Birzeit University. In Gaza, Mohammed Mahani dreams of race cars, playing oud, and karate. 5.03. Director joining via videoconference. Dema (2015) directed by Amjad M. A. Al Fayoumi. Al-Azhar University. Too young to be a bride. 3.15. Seekers for Life (2017) directed by Mahmoud Awad. Al-Aqsa University. Gaza’s used clothing market. 4.32. Private Number (2012) directed by Omar Elemawi, Al-Aqsa University. We Love Life (2015) directed by Mohammed S. Ewais. Al-Aqsa University. A portrait of graffiti artist Bilal Khaled in Gaza. 7.13. Director joining via videoconference. Moving Dream (2012) directed by Alaa Alaloul. Birzeit University. Nader dreams of going back to work. 2.00. The Cage (2016) directed by Khaled Tuaima. Birzeit University. The hazards of catching birds in Gaza. 6.42. Parkour on the Rubble of Gaza (2014) directed by Khaled Tuaima. Birzeit University. A team of athletic daredevils. 2.33. Rainbow (2004) directed by Abdel Salam Shehada. To My Father (2008) directed by Adel Salam Shehada. “Those were the days when girls were prettier, when eyes were in all colours, without any colour. What is different now - the camera, or the eyes?” asks Abdel Salam Shehada’s poetic and mesmerizing homage to the studio photographers of the 1950’s - 70’s. Set partly in a refugee camp in Rafah, this is a remarkable look back at fifty years of Palestinian and Arab history, through photographs, reportage and the voices of these photographers today. Director in attendance. Nadia Yaqub: Nadia Yaqub is Professor of Arab Culture at University of North Carolina at Chapel Hill. We Will Return (2018) by Ibrahim Ghunayim, Samir al-Burnu, Sami Shahadah, Arkan Gharib, and Faris Abdal-Malik. A music video by rapper Ibrahim Ghunayim shot at the Great March of Return. Ghunayim has dedicated the song and video to the journalist Yaser Murtaja who was shot and killed by Israeli security forces while reporting on the March in April 2018. Ambulance (2016) directed by Mohamed Jabaly. A raw, first-person account of the Israeli war on Gaza in the summer of 2014. The filmmaker joins an ambulance crew as war approaches, looking for his place in a territory blockaded under siege, and films their harrowing and heroic lifesaving work. In response to the dark chaos of war, the filmmaker learns to rely on the ambulance captain and crew, who in turn support him to make a film that expresses both the trauma and hope of the Palestinians of Gaza. Director in attendance. Advisory: Graphic war violence. Join us for a closing reception at Dear Mama Coffee’s location in the New Manhanttanville campus. It is in the southwest corner of the Jerome L. Greene Science Center’s ground floor, facing the Lenfest Center for the Arts. Copies of Nadia Yaqub’s book “Palestinian Cinema in the Days of Revolution” will be available for sale at the opening screening. With excep­tio­nal archival mate­rials and many inter­views (Alge­ria, France, Italy, United-States) Malek Bensmaïl’s docu­men­tary about Gillo Pontecorvo’s legendary 1965 film, The Battle of Algiers, will give us, sixty years after, a strong look back at this film half­way between history and legend. The black and white news­reel-style film caused a sensa­tion. Effec­ti­vely banned in France until 1971, the film took on mythi­cal status in Alge­ria, where it was scree­ned each year on tele­vi­sion to comme­mo­rate the coun­try’s inde­pen­dence. Screening and discussion with filmmaker Malek Bensmaïl, in conversation with Madeleine Dobie and Mohamed Amer Meziane. Algerian documentary filmmaker Malek Bens­maïl set up his camera in the news­room of the famous daily paper El Watan, the spea­rhead of the Alge­rian inde­pendent press, to film the proce­dures and thought processes behind jour­na­lism during the last presi­den­tial elec­tion. Accom­mo­da­ted since Alge­ria’s Bloody Decade of the 1990’s in the “House of the Press,” the jour­na­lists of the famous daily news­pa­per El Watan await the comple­tion of their new offices, a symbol of their inde­pen­dence. Tamer El Said’s ambitious debut feature tells the fictional story of a filmmaker from downtown Cairo played by Khalid Abdalla (The Kite Runner, United 93, Green Zone, The Square) as he struggles to capture the soul of a city on edge while facing loss in his own life. Shot in Cairo, Beirut, Baghdad and Berlin during the two years before the outbreak of revolution in Egypt, the film’s multi-layered stories are a visually rich exploration of friendship, loneliness and life in cities shaped by the shadows of war and adversity. The Middle East Institute is proud to be a co-sponsor of the annual New York Forum of Amazigh Film (NYFAF), a showcase of contemporary feature, documentary, and short films by and about the Amazigh people of North Africa and in the diaspora. NYFAF's mission is to create a space where the filmmakers, artists, and scholars of indigenous Amazigh identity and culture can gather yearly to share their knowledge and enthusiasm while fostering dialogue with a diverse audience of students and thinkers gathered from across New York City and the world. Through pre- and post-screening Q & As, live performances, and exhibitions of art and artifacts, the New York Forum of Amazigh Film seeks to disseminate Amazigh cinema and promote an understanding of the unique history, culture, and language of Amazigh peoples in North Africa and in the diaspora. Film screening and Q&A with Avi Mograbi, director, and Hamid Dabashi, Hagop Kevorkian Profesor of Iranian Studies and Comparative Literatures. Introduction by Brinkley Messick, director of the Middle East Institute. Avi Mograbi and Chen Alon meet African asylum-seekers in a detention facility in the middle of the Negev desert where they are confined by the state of Israel. What leads African refugees to leave everything behind and go towards the unknown? Why does Israel refuse to take into consideration the situation of the exiled, thrown onto the road by war, genocide and persecution? Can the Israelis working with the asylum seekers put themselves in the refugees' shoes? You can watch the Q&A session here. Ghost Hunting. A film by Raed Andoni. Screening and Q&A with the director and Professor James Schamus. Director Raed Andoni places a newspaper advertisement in Ramallah. He is looking for former inmates of the Moskobiya interrogation centre in Jerusalem. In his ad he asks that the men should also have experience as craftsmen, architects or actors. After a casting process that almost feels like role play, he arranges for a replica of the centre’s interrogation rooms and cells to be built to scale inside a hall – under close supervision from the former inmates and based on their memories. In this realistic setting the men subsequently re-enact their interrogations, discuss details about the prison, and express the humiliation they experienced during their detention. Using techniques that are reminiscent of the so-called ‘theatre of the oppressed’ they work together to dramatise their real-life experiences. Their reconstruction brings long repressed emotions and undealt with trauma to the fore. Working on the film takes its toll on the men – both physically and mentally. The director also appears in front of the camera; not only is he creating a stage for his protagonists, he is also coming to terms with his own fragmented memories of imprisonment in Moskobiya thirty years previously. The film Looted and Hidden focuses on a number of groundbreaking institutions that were plundered: The Palestine Research Center, the Palestinian Cinema Institution (PCI) and the Cultural Arts Center (CAS) of the PLO. These bodies were among the first to document Palestinian existence and to preserve, research and chart the visual and written Palestinian history from the late 1960s onward. Looted and Hidden , the first film devoted to the subject, follows pioneering, bold, and idealistic creators and directors and the archives they built, focusing mainly on the cinematic enterprise created by the CAS and PCI. Tracing their pillaging, administration and control by Israel - looting, censorship, denial of access, and erasure - the film raises questions about archival institutions in areas of conflict and points, as in detective work, to the need to dig into the invisible and hidden in order to reveal what has been erased or rewritten. The Narrow Streets of Bourj Hammoud is a 72-minute experimental non-fiction film about a working-class suburb of Beirut, Lebanon, called Bourj Hammoud, made as a collaboration between anthropologist and filmmaker Joanne Nucho and Lebanese artist Rosy Kuftedjian. "The Other Town" is a documentary film about Turks and Greeks and the source of stereotypes, misunderstandings and prejudices against the "Other." It is about how the stereotypes and misunderstandings are perpetuated in education in a broader sense in Greece and Turkey countries. In this film, the filmmakers have collaborated with the writer Hercules Millas to see where these prejudices are still coming from even though the last war between the two nations took place about a 100 years ago. They filmed the national celebrations, religious ceremonies and history lessons in both countries throughout a year to find an answer to this question. The film has won the "Audience Award" at Thessaloniki Documentary Film Festival and the "Best Historical Documentary" at Greek Film Festival, Chicago. To find more information on the film, and watch the trailer, click here. Please join us for a screening and discussion of five short films by up-and-coming Armenian filmmakers Ophelia Harutyunyan, Jesse Soursourian, Viktorya Aleksanyan, Eric Shahinian, and Anahid Yahjian, followed by a Q&A with the directors moderated by Raffi Asdourian (from A&E, Sundance Channel). This event is free and open to the public. Food and refreshments provided. This event is organized by the Columbia graduate student group OASIES (Organization for the Advancement of Studies of Inner Eurasian Societies), and sponsored by the Armenian Society of Columbia University, the Harriman Institute, the Middle East Institute, the Kurdish Studies Student Association, and the Armenian General Benevolent Union. Kamran Shirdel is considered one of Iran's most influential documentary filmmakers.Women's Prison (1966), Tehran is the Capital of Iran (started in 1966, but finished in 1980), The Red Light District (1967-80) and The Night It Rained (1967) are among his most well-known films made during the Pahlavi era. Throughout the 70s and 80s, he directed a substantial number of commissioned industrial documentaries, many of them now considered as the classics of their genre in Iran, for their lyricism, abstraction, and irony. Amir Naderi, now living in New York for more than two decades, has directed some of the most celebrated films in the history of Iranian cinema. After a number of years of working in the film industry as a still photographer, he made his feature debut Goodbye Friend in 1970, and in 1971 The Dead-end. Shot in stark black and white, these two films offered shockingly dark images of the urban sprawl that is the capital of Iran. The Runner made in 1984 became the first film from the post-revolutionary Iran to gain international acclaim. In 1993 Naderi made Manhattan by Numbers, his first film after moving to New York. Hamid Dabashi is the Hagop Kevorkian Professor of Iranian Studies and Comparative Literature at Columbia University. After finishing his first college degree at the University of Tehran he moved to the United States, where he received a dual Ph.D. in Sociology of Culture and Islamic Studies from the University of Pennsylvania in 1984. He wrote his doctoral dissertation on Max Weber's theory of charismatic authority with Philip Rieff, the most distinguished Freudian cultural critic of his time. He engages with Iranian cinema by not only placing specific filmic texts within the larger socio-political context, and the Iranian intellectual history, but also by opening them to other artistic modes such as Persian poetry and fiction. This event is sponsored by Columbia's Middle East Institute, MESAAS, and School of the Arts (FILM). Join Mario Rizzi for a screening of his documentary Al-Intithar (The Waiting), which narrates the life of a Syrian refugee mother and her three children in Jordan's Zaatari Camp. The short film was first shown at the Berlin Film Festival competition in February 2013. Film to be followed by a Q&A with the director. This event is sponsored by the Middle East Institute. 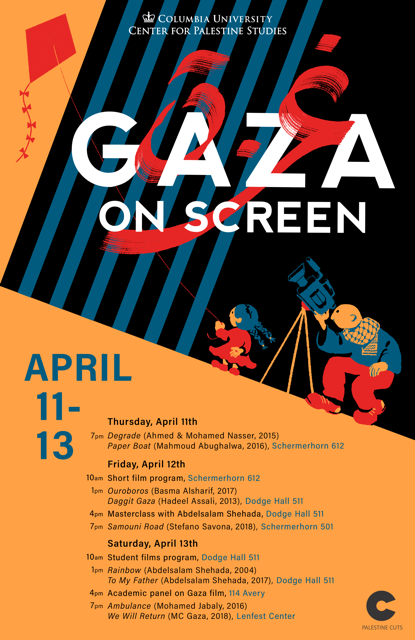 This event is sponsored by NYU's Tisch School of the Arts, Columbia's School of Art and Film, the Iranian Studies Initiative and the Middle East Institute. Women Creating Change, a global initiative of the Center for the Study of Social Difference, is proud to invite you to a film screening and discussion, featuring acclaimed film director Mira Nair (Salaam Bombay, Monsoon Wedding, The Namesake, and now, The Reluctant Fundamentalist). Nair will be in conversation with Mabel Wilson, Columbia Graduate School of Architecture, Planning, and Preservation and Anupama Rao, Barnard Department of History. Lila Abu-Lughod, Director of the Center for the Study of Social Difference will moderate. Click here for directions to Columbia University. Seating is limited. Priority will be given to attendees with Columbia University IDs. Overflow space is available in 114 and 115 Avery Hall, and in Brownie's Cafe. Join us for a screening of short films and videos followed by a Q & A with Syrian playwright and activist Mohammad Al Attar and theatre director Eyad Houssami, editor of Doomed by Hope: Essays on Arab Theatre. This program of short films and videos by activists, amateurs, filmmakers, and citizen journalists offers intimate perspectives on the tragedy in Syria today. The videos include new material from film organizations such as Kayani for Audio-Visual Arts and Abounaddara, which broadcasts emerging talent directly online. The title is a tribute to the late Syrian activist Basel Shehada, who was killed in May 2012 by government shelling on the besieged city of Homs, where he was filming and training other activists. Sponsored by Alwan for the Arts and the Middle East Institute. "This is Where We Take Our Stand" is the story of fifty five courageous veterans who publicly told their accounts of the realities they witnessed on the ground in Iraq and Afghanistan. In March of 2008, two hundred and fifty veterans and active-duty soldiers marked the fifth anniversary of the invasion of Iraq by gathering in Washington, DC, to testify from their own experience about the nature of the occupations of Afghanistan and Iraq. It was chilling, horrifying, and challenging for all who witnessed it. Against tremendous odds, they brought the voices of the veterans themselves into the debate. "This is Where We Take Our Stand" is the inside story of those three days and the courageous men and women who testified-a story that's as important to tell today as ever. The Q&A will feature Jose Vasquez and Jason Lemieux. Jose Vasquez is the Executive Director of Iraq Veterans Against the War. He served fourteen years in the U.S. Army and was honorably discharged in 2007 as a conscientious objector. Jose was a key organizer of Winter Soldier: Iraq and Afghanistan, Eyewitness Accounts of the Occupations and represented IVAW in the editing process for the book published by Haymarket. He is pursuing a Ph.D. in Cultural Anthropology at CUNY Graduate Center conducting research on the politics of veteran status in contemporary American society. Jason Lemieux testified at the Winter Soldier Hearings. He served three tours in Iraq with Third Battalion, Seventh Marines. Lemieux is a Masters Candidate at Columbia University's School of International and Public Affairs (SIPA). Co-sponsored by the Middle East Institute and the Human Rights Working Group. Co-sponsored by the Middle East Institute, the Human Rights Institute at the Columbia Law School, and Columbia University's Anthropology Department. BETWEEN TWO WORLDS is a groundbreaking personal exploration of the community and family divisions that are redefining American Jewish identity and politics. The filmmakers' own families are battlegrounds over loyalty to Israel, interpretations of the Holocaust, intermarriage, and a secret communist past. Filmed in the United States and Israel, this first-person documentary begins with a near riot at a Jewish Film Festival in San Francisco, reveals the agonizing battle over divestment from Israel on a university campus, and shows the crackdown on dissent in Israel itself. Film Screening and Panel Discussion: "We Are Egypt"
This documentary tells the story of the story of the struggle for democracy in Egypt that led to the historic uprising in January-February 2011. Filmed on the ground in Egypt over the preceding fourteen months, this story is told through the eyes of Egypt’s youth activists, labor movements and political opposition figures. It is an account of their struggle against extraordinary odds to remove an uncompromising US-backed authoritarian regime determined to stay in power. Going beyond the recent headlines, director Lillie Paquette offers the background story of years of mounting political resentment against the ruling regime. This event is sponsored by the Institute of African Studies, Institute of Comparative Literature and Society, and the Middle East Institute. Documentary Film on the origins of the Egyptian revolution by Lillie Paquette. Co-sponsored with the Center for the Study of Democracy, Toleration, and Religion, the Institute of Religion, Culture, and Public Life. An episode from the wittier, edgier second season of Sayed Kashua’s hit TV satire. Co-sponsor: The Center for Palestine Studies at Columbia University. Film Screening and Discussion of "Charents: In Search of my Armenian Poet"